Hello, La Dolce Vita readers! It is Erin Hodges from Fig + Cotton with my first Effortless Entertaining post! As a new contributor, my posts will be full of fun and easy entertaining ideas and tips including interesting menus, fool-proof recipes, free printables, charming party decor, and beautiful tablescapes. Since tomorrow is Thanksgiving, today's post is all about conquering those last minute details for an unforgettable feast. 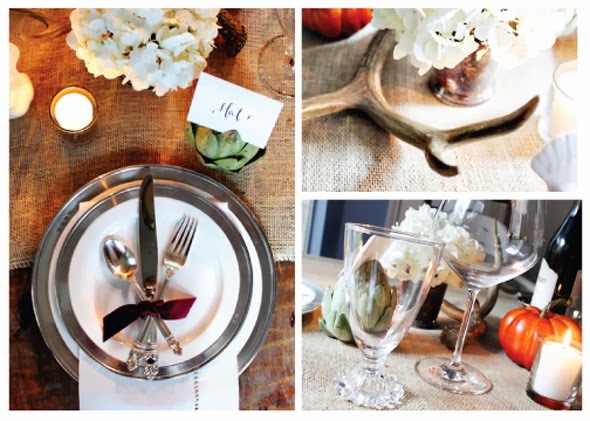 Below you will find an elegant and rustic place setting for you to quickly recreate at home before your Thanksgiving guests arrive. Further down, you will find a menu full of simple, but delicious, recipes that you can whip up tonight or tomorrow morning. Your guests will never know you waited until the last minute! A festive table doesn't need to be difficult. Look around your home and use what you already have on hand. For example, I used tarnished mint julep cups, antlers, and some left over plum velvet ribbon to create an elegant dinner space. Once you start thinking outside the box, you will be surprised what you will find on your bookshelves and mantel! Don't stress about florals. I used a simple white hydrangea bloom in a tarnished mint julep cup, and you can find gorgeous flowers in most of your local supermarkets. Keep the blooms in the same shade for easy arranging. Use your linens, dishes, and glasses you have on hand, and add small holiday-specific accents and pops of color such as the plum velvet ribbon and the faux deep orange pumpkin. In my linen closet, I keep napkins and table cloths in multiple shades of white, burlap runners, and other neutral fabric remnants for easy access. 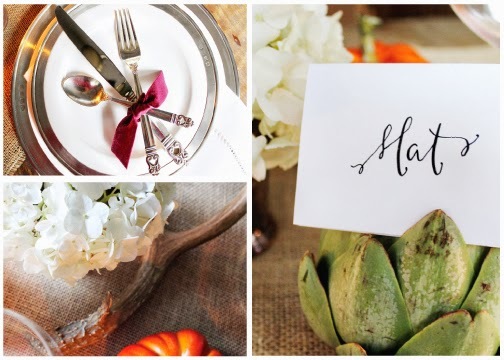 Finally, use place cards; they make everyone feel special. I was lucky enough to have some beautiful place cards done for me by calligrapher extraordinaire, meme davis, but a white piece of card stock and pretty handwriting does the trick! Now to the menu-- each recipe below is either quick and painless or something you can do tonight and reheat tomorrow. As opposed to cooking a whole turkey, which would have required that you buy in advance and thaw, I recommend a turkey breast. And, although the recipe below is a good one, to cut down your dinner prep time, purchase a pre-cooked breast if you can find one. 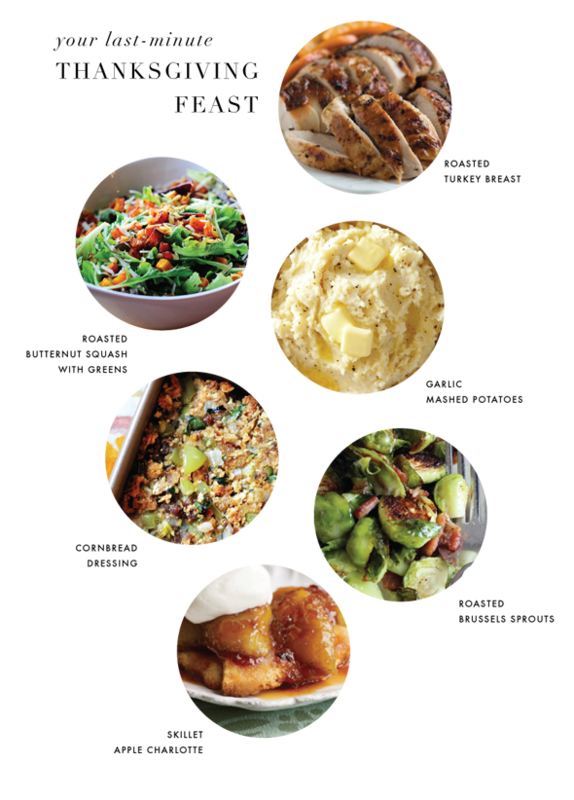 With these memorable and hearty sides, your guests will definitely be impressed. This is precisely what I do to help eliminate the stress in entertaining, I use what I have around the house for my center pieces and tablescapes. But, I am gonna use the white cardstock idea for nameplates. I wasn't sure if I was even going to do that, but then reading this post, I thought duh... simple and it will be a beautiful complement to my setup with a gold marker! The whole menu looks really good and you're right about using stuff from around the house for the table setting. It's all about simplifying!